My name is Huck. You might consider me exceedingly vain but there’s no doubt in my mind of the striking resemblance between that New York Rangers goalie Henrik Lundqvist and me. The blue eyes, gorgeous masculine face, muscular body. We’re both regarded as world class athletes; Henrik by the sporting world and Huck, well, by me. Henrik came to the Rangers by way of Sweden. I came to living on the fifteenth floor of a building directly across from the iconic Central Park by way of the Animal Control Center on 110th Street. “Man, you’re a good looking dog,” the guy said. When we arrived on 110th street at the Animal Control Center, he told them to call me ‘Pretty Boy’. 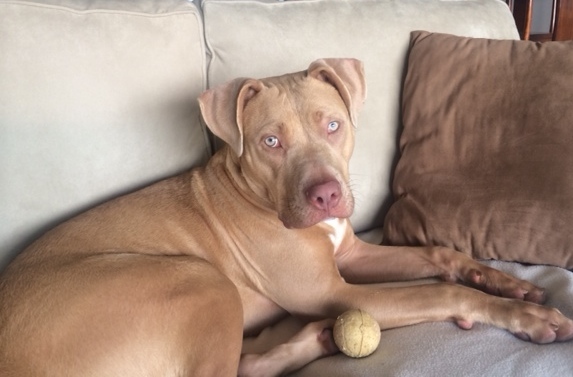 With two strikes against me – part pit bull and suffering with kennel cough – it became clear I’d be euthanized within days, even at my puppy age. But the Buddhist in me kept repeating that line. Manifest what I want. Like the surfer dudes on Venice Beach, I also knew my looks would help. And it worked. I’d been stigmatized and almost euthanized, but a woman showed up just in the nick of time and adopted me. Now I’m lying on the couch in her place – my place too now – with a panoramic view of Central Park. When the terrace door is open I can hear horse drawn carriages pass by. Those giant horses that I bark at all the time on the street are a lot less intimidating from up here. The woman loves to see the world through my eyes. She told me so. Said that the news on television is just so full of sadness and tragedy and that my playfulness is a welcome relief. I like to chill out but she talks to me a lot. Like I’m a human or something. Though it’s cool how she really loves me. Just hope she’s got some clue how happy I’m feeling about my new situation. But I do love that walk through the Park when we hit the ball fields. I stop dead in my tracks. As I dreamily imagine metamorphizing into one of the players, she tugs on the leash. When she finally gets me to move, I’m resigned to just being a dog, for this lifetime as least. The woman often wonders why anyone would abandon me. “What transpired the first ten months of your life?” she asks as she stares into my beautiful blue eyes and scratches my back. She seems haunted at times by my unknown past. And I can’t tell her what happened. Not sure why God made that landmark decision that dogs shouldn’t speak, but it sure makes for a lot of heartache. If only there was a court to appeal to since I have so much to say. Especially to Henrik.